Continuing in its creation of an alternate universe of 3-stripes icons, adidas Originals’ A//D (adidas Parallel Dimension) series returns this month, applying a subversive lens to a duo of basketball models to create the Crazy 1 ADV and Crazy 8 ADV. 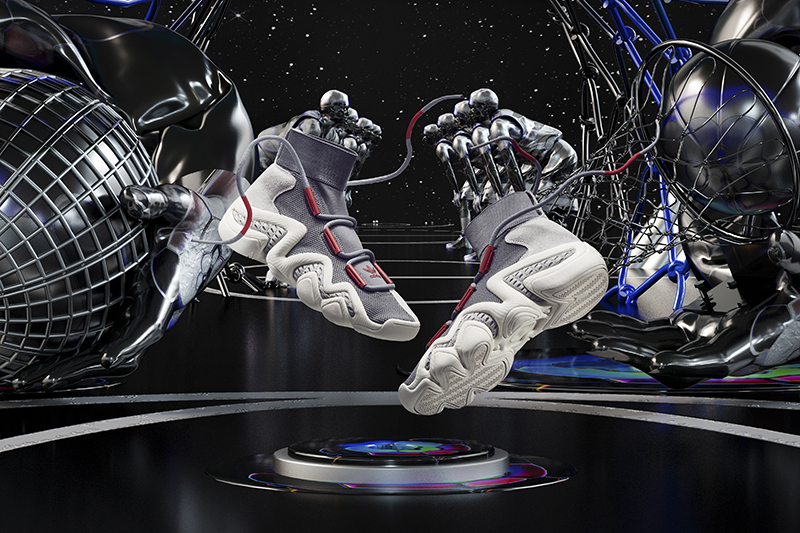 The second chapter in adidas Originals’ A//D story, each shoe in the release tells the science fiction story of the discovery of a massive black hole in space. Subsequent expeditions to the black hole reveal a portal to an alternate dimension in which everything is virtually identical to our current universe, save for a number of cosmetic differences in familiar objects. Following several expeditions through the black hole, a number of classic adidas models from the early 2000s are discovered, almost the same as their “original” counterparts, but distinct in their material makeup. The models then serve as artefacts of this expedition, closely resembling their “original” counterparts in virtually every way, but with marked differences in their construction and design. Though each shoe’s distinctive midsole tooling retains its original form, their uppers drastically depart to create a visually-similar shoe with different tactile qualities. For both the Crazy 1 ADV and Crazy 8 ADV, this sees each shoe’s more familiar suede and technical fabric constructions switched out for breathable mesh and textured knits, structured with panels on the heel and toe box, rendered in dystopian, greyscale colourways. Finishing touches include silicone branding hits and futuristic lacing systems, compounding the science fiction aesthetic of the release. As a final touch, alluding to the other-worldly narrative of the A//D project, each shoe features concealed graphics and labels within its design containing notes on the expedition and details about the shoe’s discovery. Not immediately visible, the notes require closer inspection and deeper exploration to be found, mirroring the fictional mission that led to the shoes’ discovery themselves. The effect is true to the A//D ethos; an unsettling exploration of what happens when the familiar is made unfamiliar, and when the known is reconstructed through the lens of something unknown. The adidas Consortium A//D will be launching December 7 at selected retailers such as hanon.